Proctoring, or invigilation, in the digital world, is defined as a service that enables test candidates to take an assessment under a degree of supervision to ensure the security of the test environment and the integrity of the testing experience. Proctoring services might include controls such as a secure browser, use of the candidate’s screen, cameras, and microphones, and other options to provide live or post-exam reviewing. The IMS Proctoring Services specification is based on the Learning Tools Interoperability® (LTI®) core v1.3 standard and LTI Advantage extensions. LTI works on the concept of a browser-based launch from a platform into an external tool or application. 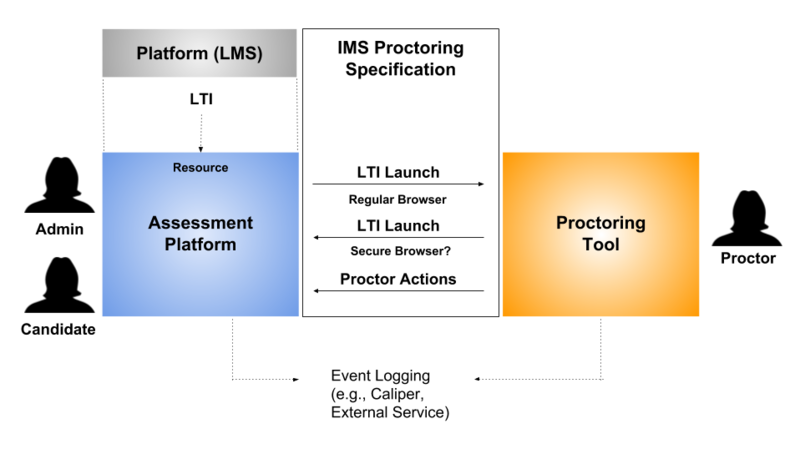 For proctoring, a test delivery or assessment management system would be the platform and the proctoring service the tool as illustrated in the following diagram. The IMS Proctoring Task Force is working to publish the draft specification documentation in early 2019. Task Force members collaborating on the development of this specification include ETS, Open Assessment Technologies, Pearson, ProctorExam, Proctorio, ProctorU, QuestionMark, University of Central Florida, and others. If you have any questions or would like to get involved, post a note in the IMS public forums or contact us.